With this series of posts over the next few weeks I am attempting to help those new to Amazon Web Services (AWS) get a step up and to help you avoid some of the pitfalls that I have encountered, the sort of guide I would have been biting peoples hands off for when I was in the same boat, but before we go any further, a picture, people like pictures, you are people so here’s a picture. 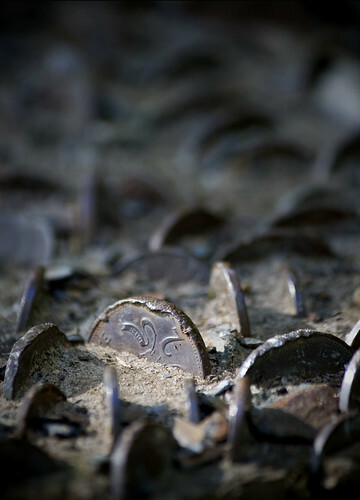 It’s a picture of a tree trunk which over the years has been embedded with coins, people walk by, they see that someone has pushed a coin in, so they do the same, rinse and repeat for 10 years or so and you end up with several trees like this one. This is essentially what the Cloud is to people, 5 years ago, no one knew what the cloud was, no one cared, 3 years ago, people said “Hey, look at this”, 2 years ago people said the cloud was going to change the world, a year ago people said big business was adopting the cloud and today I tell you not to with out reading through this. Although I am going to focus AWS the topics covered are more than likely relevant to other cloud providers and I would encourage you to read through this to cement the foibles of the largest cloud provider Amazon, so you can better understand the contraints they place on you and those of other cloud providers may place on you. Now on with the post. In the beginning there was only one way, build a data centre, source your own power, cooling and network and start building out a data centre full of disk arrays, high performance servers and networking equipment, I would label these the “Golden age” but truth be told running your own data centre from the ground up can not be easy. As with everything progression; some smart people noticed an opportunity and started to take over the management so all you had to do was turn up with your server, disk arrays, and networking, this is co-location and is a good way of doing things, this is not as cheap as doing your own but takes a lot of hassle out of it. Leading on from this companies began to form that went one step further, they would provide your equipment for you so all you have to do now is login, all the disk worries, network were taken care of and they would help you on your way, of course charging a premium for the service. Moving on from this but in the same area of hosted services are the almost fully managed solutions where they do everything, you give them an application and they make it happen, great if you don’t have an IT team. So getting onto more recent times, virtualisation has really taken off in the last 10 years despite being around for longer, I believe the big drive for this was after the “.com bubble” burst back in the early 2000’s and companies were looking for ways to save costs on their hosted or co-location services. One of the ways this was achieved was through virtualisation such as Xen and VMWare. In most cases the equipment was run and managed by the company and people over allocated or under allocated memory and CPU depending on their use profiles with all sorts of redundancy. As you can see from all of this the constant push is to reduce costs, granted running your own data centre is the cheapest way, but you will need a few thousand servers to make that so. Faced with a problem a company called Amazon, who you have probably heard of, they run a web shop by the way; noticed that even with all of their virtualisation technology they still needed a large percentage of servers just for 2-3 weeks of their business each year, the rest of the time te boxes sat idle; but what are you to do, you have to have the capacity for your peaks. Well they worked it out and we have the cloud, i’m not 100% sure if they had the big idea but they certainly took the idea and ran with it. The idea behind Cloud computing is a utility based cost $X per hour, this comes across as a very cheap modle but as we’ll find out later in the following posts it’s not that cheap and it depends heavily on your use modle. With the Cloud you now have the ability to choose how much disk you want and for how long and how much CPU time you need. This is the joys of Cloud computing. That was a rather long introduction to the cloud but with this understanding of the history behind it and how it was born you will now hopefully appreciate where it is going. I wouldn’t be surprised if most of the the features Amazon release are just new ways of them making better use of their own applications and architecture and then working out how to do that more times to cover the costs and offer it as a service.